Despite the fact that I haven’t posted anything new in a few centuries, I have been actively studying Korean. Coming back from Korea was a whirlwind of adjustment and academic rigor and it took all of my focus to keep up. Actually about me in the morning. During post-Korea life, my sleep deprivation has vastly increased. Well, not all of it. I’ve started translating Korean poetry as a self-study method. My current focus is on an anthology of Koreans’ 100 Most Beloved Poems, or 한국인이 가장 좋아하는 명시 100선. A very good friend of mine gifted it to me just before I left Korea. I dabbled in this briefly before, with David R. McCann and Jiwon Shin’s book of selected poems by Pa Chaesam, but I mainly read the poems, looked up the words I didn’t know, and then read the translations to see how much I had understood correctly (it’s a bilingual book). Unfortunately, I don’t think I remember a single word I ‘learned’ via that method. Writing things down is a key part of improving your memory. FYI, the ~(이)라 functions as a much older way of saying ~(이)다 in this context. Likewise, ~더라 and ~느/리라 can function as ~었/았/였다. If you have been to a Korean church or read poems, older fiction, etc., you’ve probably encountered this ending used in situations that aren’t commands or indirect speech…now you know why! I’m not quite sure why an afternoon is a percussion, though I can understand the afternoon being dazzling, and I can also recognize that some people’s ability to keep a beat is incredible…but the relevance is nonexistence and I am clearly grasping at strange translation straws. Me every time I finished “translating” a verse. Moving on to the line that really bothered me, however, brings us to the grand finale of this pretty yet rather depressing ode to starting over. Not terrible, 그죠? Obviously “the most sufficient place” is awkward. But it’s kind of pleasant-sounding. But my original translation was so strange. If you read the entire poem, you’ll understand how incredibly anticlimactic this is. I want to be the morning star! A stepping stone! A flower on the mountain! And now…..! Okay, 이종석. You, me, and 이성희 시인님. Or so it seems. 저녁, of course, is commonly interchangeable as evening or the meal you eat in the evening, dinner (or supper, depending on where you’re from/how you’re raised). 맞다 is the ever-present word for Korean language learners – “That’s right, right, yep, mhm, of course, right it is, right you are.” Right right right. But 맞다 has many other meanings. 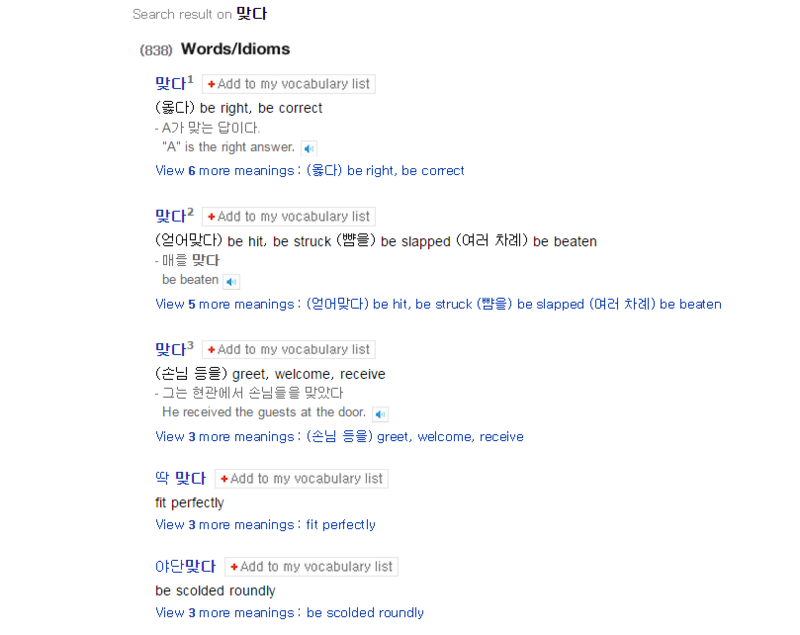 For whatever reason, I decided that “I want evening to be correct” and “I want to hit the dinner” were all incorrect so I think I made up my own meaning for 맞다 and wrote it as “to have dinner.” After digging through Naver definitions more, however, I realized how perfectly the third definition could work – I want to greet the evening! That’s poetic and not actually a totally weird thing to say! Right? 미션 성공? Stellar translation job from the very beginning, awww yeah. There are so many problems with my translation of this poem, but I’m not too worried. I’ve translated several subsequently and none of them have gone this badly (at least, they don’t sound as strange). It’s possible it was the poem, it’s possible I simply failed at translating because it was my first time, or perhaps it’s chock-full of difficult, archaic colloquial words. I’m pretty sure it’s all three, actually. Regardless, I enjoyed the adventure of translating and I intend to keep it up. A surprising number of words stuck in my head and while of course the danger is that these words are often far less common in normal speech – or perhaps nonexistent in everyday speech – poetry is a beautiful manifestation of the emotion in language, and it has its own things to teach us just as well as webtoons, novels, kdramas, and music can help us self-study Korean. Have you translated Korean poetry or had any mishaps in translation in general? ooh, I love this! Wow. Thanks so much for sharing. I don’t have an 8tracks account – is there another way to follow you? Sorry i’ve never got a notification that you replied!